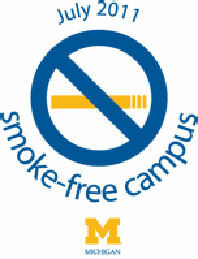 It was in April 2009 that the announcement was first made that all University of Michigan campuses will be smoke-free by July 2011. A special committee is working on the final phase of the plan to make sure that the UM-Flint campus will be ready to go completely smoke-free by the July 1 deadline. Signage reminding everyone of the date will be placed at nearly 40 locations on campus in late March or early April. Some of the Flint committee members also serve on committees in Ann Arbor, where posters and brochures are being designed and printed for all three U-M campuses. Many of the posters will be aimed at smokers who are considering quitting. In an effort to assist and encourage smokers to kick the habit, U-M will offer faculty and staff free behavioral sessions and selected over-the-counter smoking cessation products, along with co-pay reductions for prescription tobacco cessation medicines. The University Health Service will offer behavioral counseling and discounts on smoking cessation aids for students. More than 260 campuses in the U.S. are now smoke-free, including our Big Ten counterparts University of Iowa and Indiana University. Even campuses in states with substantial tobacco production, such as the University of Kentucky, have enacted similar policies. The MHealthy Tobacco Consultation Service is offering a seven-week quit tobacco program with new programs starting almost every month. If you are interested in learning more, you can attend an upcoming meeting.